One of the aspects I love about our alphabet series and exploring common objects in our everyday lives is that the kids get to continually encounter the items as we are learning about them (and long after). It really strengthens their enthusiasm and deepens their understanding. As part of the S is for Seeds series the kids helped us collect seeds. Lovey often caught me when I forgot to get some of the seeds out of a food or off of the ground…she was so into collecting them! And how awesome is the boys’ mom? She and Big Buddy collected all of these seeds (and many more) and even labeled them for me! The day they brought their collection of seeds the kids spent some time doing a bit of “show-and-tell” as they talked about their seeds and where they found them. After the kids shared, I put together a few seed trays with a hand lens and various seeds from our collections. The kids spent some time observing the seeds with the hand lens. As they did we talked about how the seeds looked (shapes, sizes, colors). Then I encouraged them to touch some of the seeds and think about whether they felt the same or not. Soon they realized that the seed coverings felt different. Some were hard. Others were a bit squishy. Some were smooth, and others had some bumpy spots. Some were just too tiny to examine. We also took some time to open up and look inside the seeds that we could open. The kids were surprised at how different the insides of the seeds were. Lovey had been patiently waiting for the day we could open the avocado seed to look inside, so she was very excited to start peeling off some of its outer layers. Not long after that Lovey accidentally dropped a seed onto her try, and the kids discovered another way of comparing seeds. 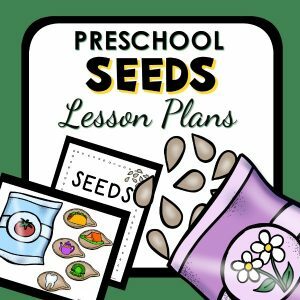 They took one seed at a time and listened to the sound the seed made as it fell on the tray. Some you could barely hear. Others made loud thumps. I loved seeing them come up with new ways to investigate the similarities and differences of seeds! After their investigation we discussed some of the things they noticed about the seeds, and they concluded that seeds are different. 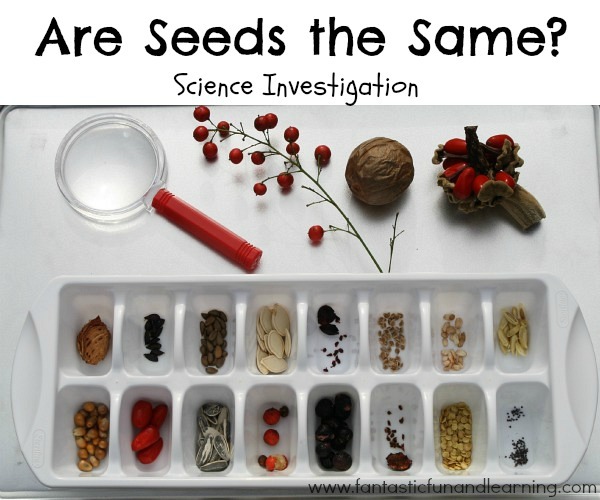 What ways have you observed and compared seeds with your kids? Children are born investigators. 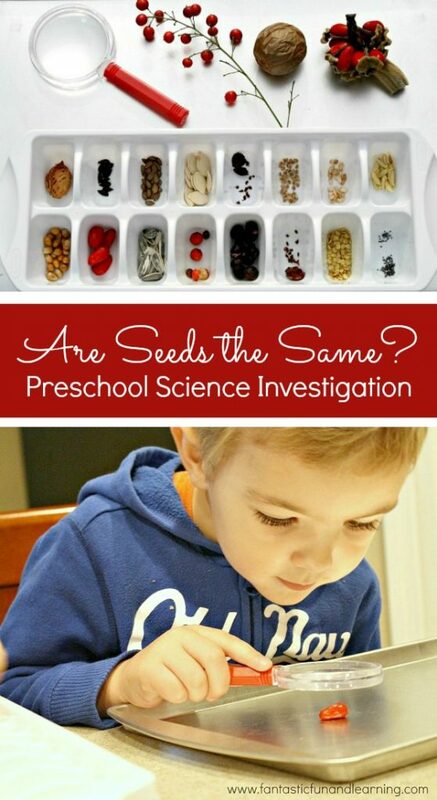 I just love this seed sorting activity — what a great experiential learning activity. Thank you. Edna Wallace, Editor Pages, Inc. I agree! 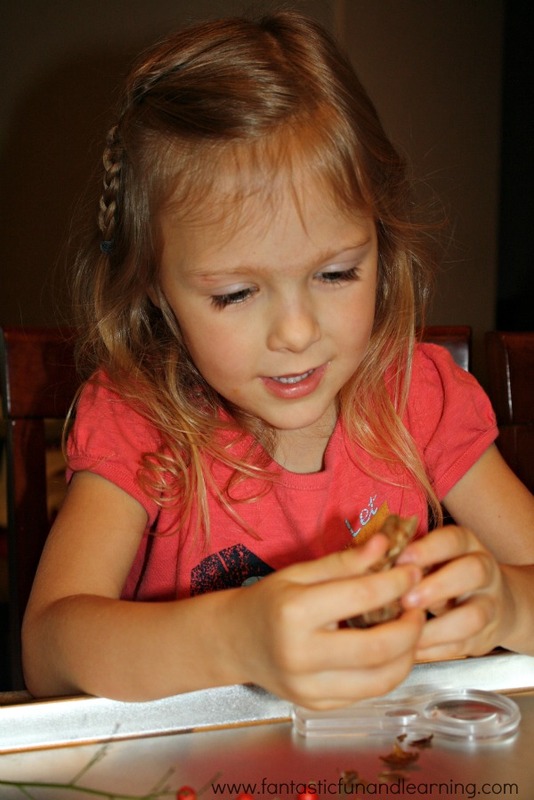 I feel like my job with the kids is to nurture that natural sense of wonder and help them find new ways to explore. I’m glad you liked this activity. 🙂 Thank you! It was a very engaging investigation for us. 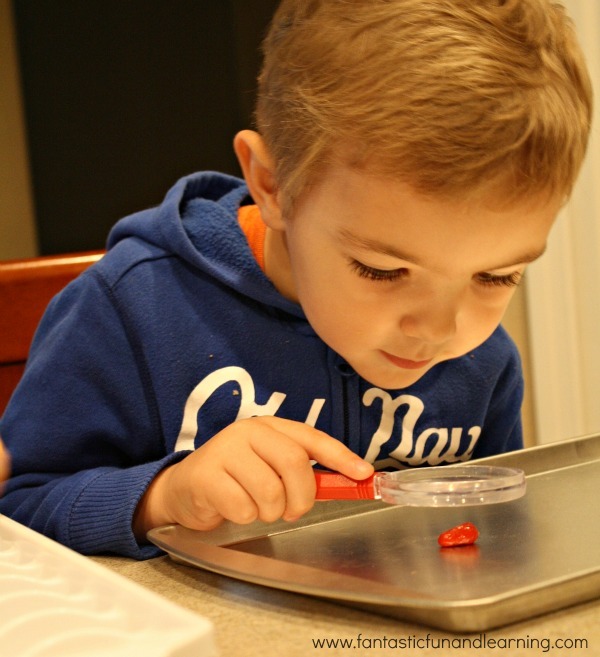 I love how you engaged so many senses in your investigation of the seeds. Your post makes me want to reach in and touch the seeds in your lovely photo! Thank you so much! The kids really enjoyed the activity, and they continue to make new observations about seeds often since finishing our seed investigations. I really like all your seed investigations! So much can be learned by just observations! Thank you! Sometimes I think it is easy to get too elaborate with activities and crafts, so I try to really encourage the kids to investigate everyday materials. So far they seem very intrigued, and the learning that is happening is so encouraging. This is wonderful! And it’s perfect for springtime!! I’m going to share this on my PreschoolPowolPackets Facebook page too! What a great idea! 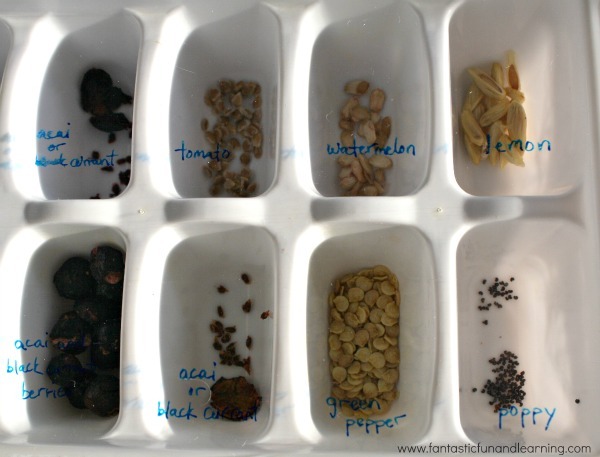 I love how you used ice cube trays to organize the seeds. This activity would go wonderfully with our unit study this week. Thank you for Sharing! Oh fun! 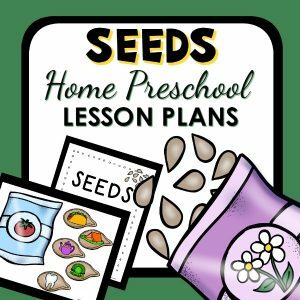 LOVE how you used real seeds! 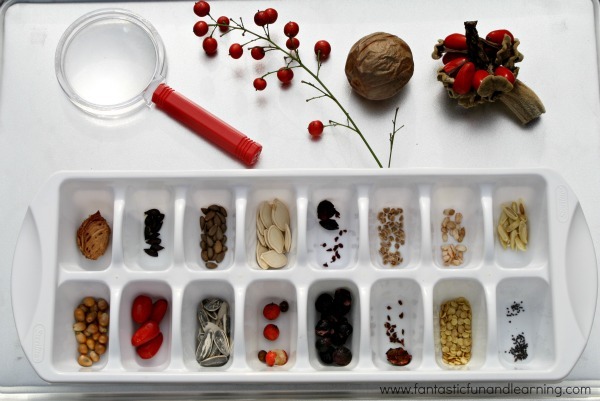 We did something similar, but used pictures of different seeds online… If only I had been a bit more organized… Ha! You should! I bet you’re getting close to your planting season now that spring has finally arrived. 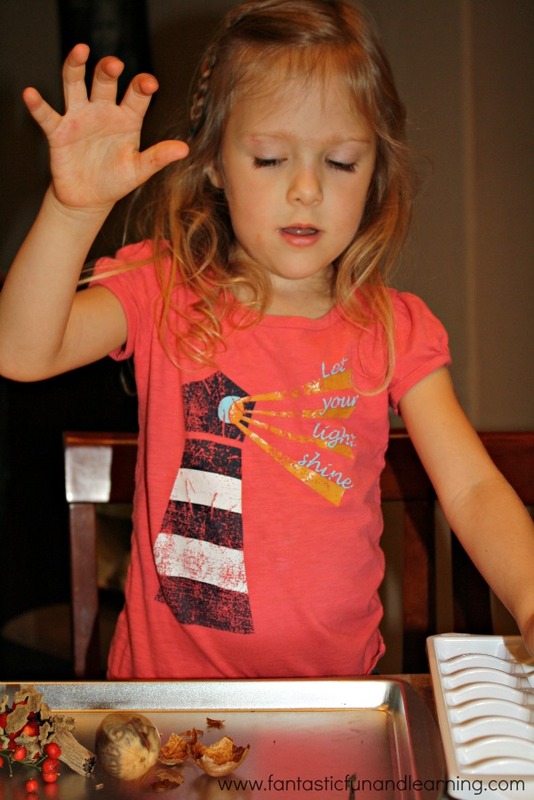 We ended all of our seed activities by planting seeds…such a great full circle theme! This would be another great one to link at Look What We Did. This looks like such a fun learning activity. I bet the kids had a blast. I am loving your whole seed unit! Thanks so much for sharing your wonderful activities. Pinning now! Thanks, Katie! We’ve got a few more posts coming up before we finish the series. I hope you enjoy those ideas, too!